Planners are All the Rage! If you are a fan of the papercrafting world then you have inevitably come across a planner. 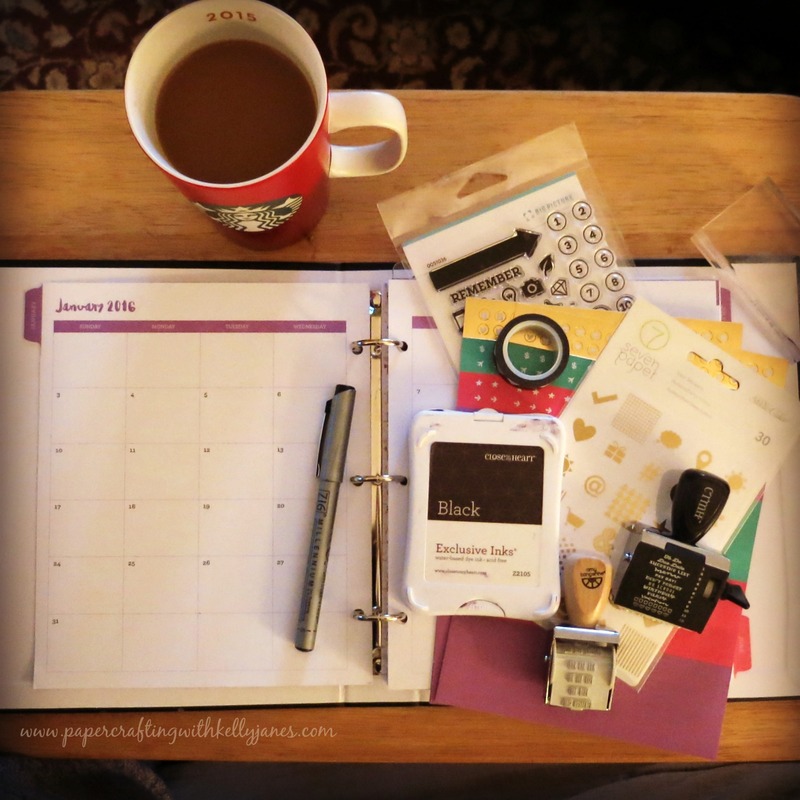 I love the idea of a planner, but struggle a bit with the functionality of it. Is it a mini album, a scrapbook, a journal, is it a planner that I carry in my purse….what exactly is it’s purpose?!? If you’re like me then this blog hop is for you! 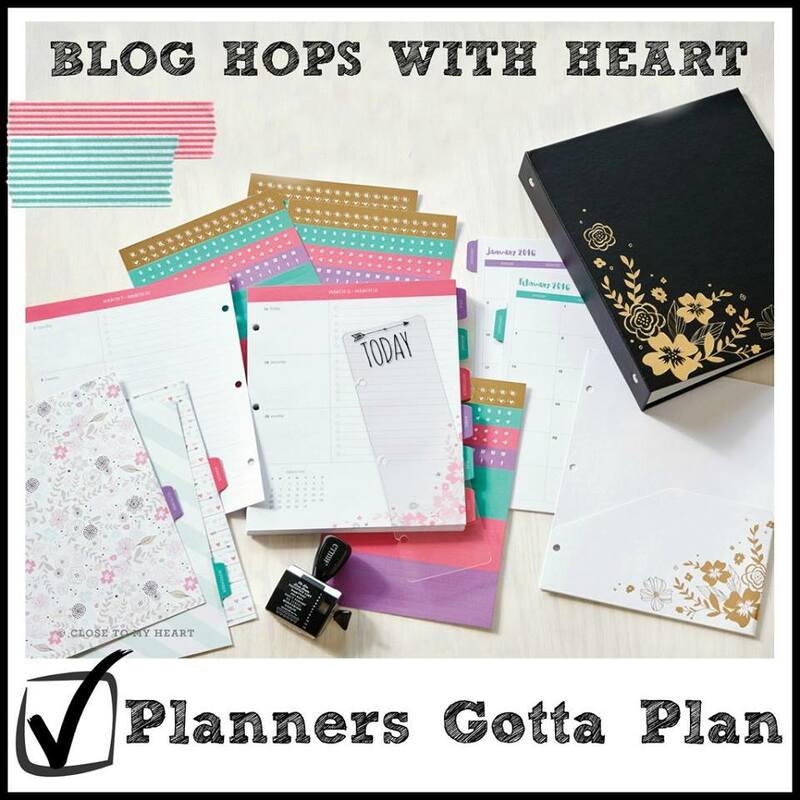 Today you will get different viewpoints, showing the functionality of different planners and planner accessories as you make your way through the Blog Hops With Heart ‘Planner’s Gotta Plan’ blog hop. If you started from the beginning you would have come from Amie Kiger’s blog, but if you started here that is perfect also because this blog hop is a circle. Just click the link at the bottom of my post and it will send you to the next blog and eventually you will make your way around the entire circle. The planner that I chose to purchase for my very first planner was the new CTMH Everyday Life™ Planner Album & Pages (pictured above). I was unsure of how exactly I would want to use it, but knew I wanted to purchase it and try it out. I also purchased some added accessories-the Roller Stamp, the My Crush®Everyday Life Pages, there is also Photo Protectors & Washi available but I have a bountiful stash of that already! Ha! After I had my supplies and the calendar pages placed into the three ring binder I looked at what was remaining. I’ve decided at this time I will not use the My Crush® Everyday Life Pages in my planner, but rather I will use them for scrapbook layouts (see below). 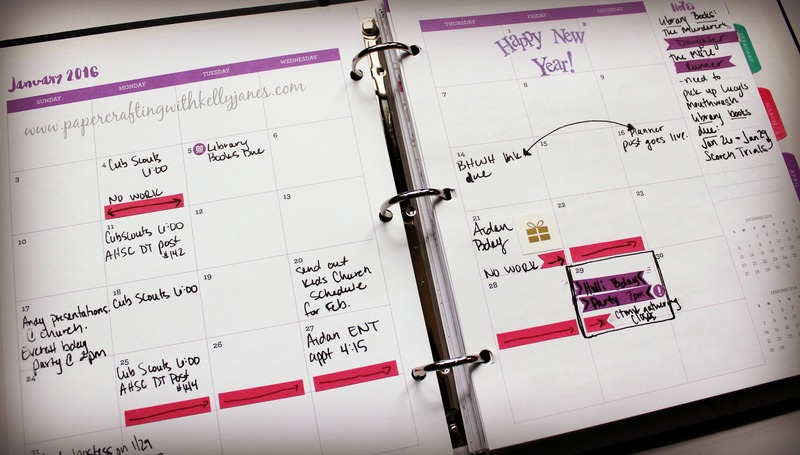 The CTMH Everyday Life™ Planner works well with other planner products that are on the market. I used Studio Calico Seven Paper stickers and Big Picture Classes Stamp Set with my planner, along with other stamp sets that I have in my stash. The CTMH Everyday Life™ Planner comes with a month in review (the entire month sprawled out in 2 pages) and then each day of the month broken down with room to write. I’ve decided to use the month in review to write appointments, reminders, etc and then the pages with the individual days to use basically as a journal. I jot down funny things that my son says or things that we did that weren’t necessarily planned out…going to the movies, shopping trips, etc. So in essence I use the CTMH planner for 2 purposes…to use as an actual planner and to record everyday moments. Or as Heidi Swapp would say, “one little thing everyday”. So now onto the details of my layout. I started this layout with a White Daisy Cardstock base. Then I grabbed the My Crush® Everyday Life Pages and created a cluster for my photos. Once I had the cluster arranged the way I wanted, I grabbed Magenta Shimmerz Paint and used the packaging technique around the cluster to create interest on the White Daisy Cardstock. The title is from The Cut Shoppe and cut on a scrap piece of white daisy cardstock that already been covered in mixed media and another My Crush® Everyday Life Page. The embellishments include Heidi Swapp glitter arrows, My Minds Eye black enamel dots, and CTMH (retired) Laughing Lola enamel gems & paperclip bow. Once I had all the papers layered and adhered I added a layer of vellum under my photos. I then added a little black stitching, a couple strips of grey polka dot washi, and my journaling to finish things off. 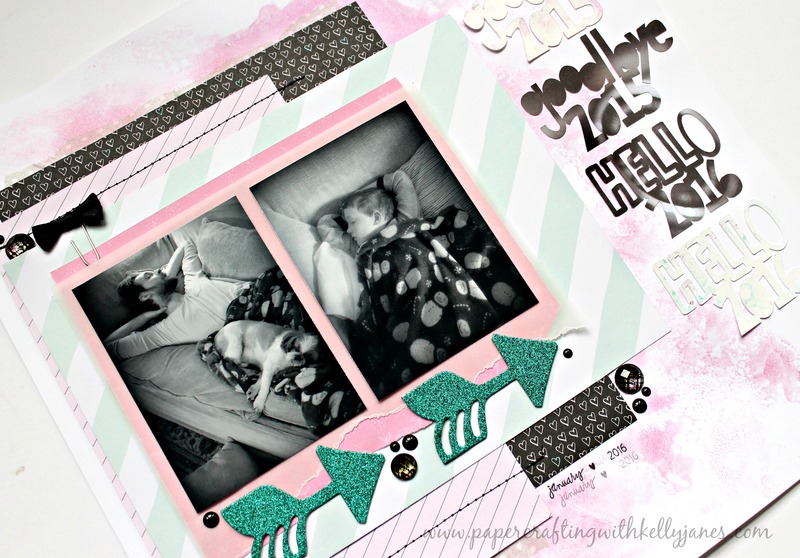 I’m linking this layout to the The Cut Shoppe ‘Cut It Out’ Challenge. I hope you’ve enjoyed my projects and found some inspiration from my post! 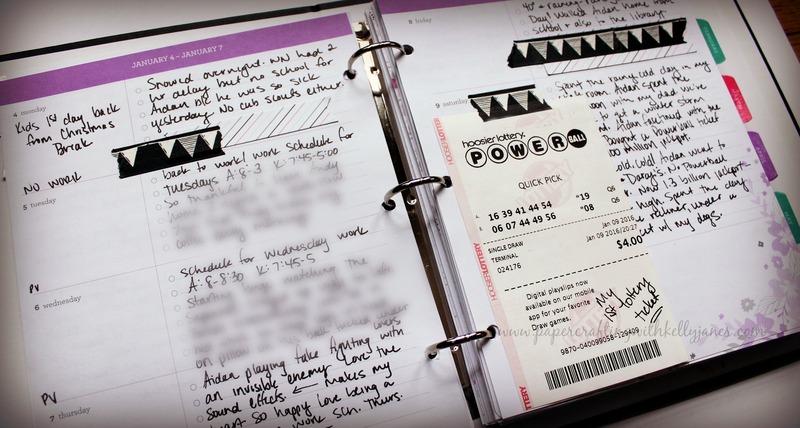 Now it’s time to head to Becca Whitham’s Blog to check out her planner project! Oh, help me! Your layout is GORGEOUS!!!! Oh, I just love how you used the paints! It all comes together soooooo beautifully! OK, so yesssssss–I HAVE to see my entire month at once and I use the separate weeks to record everything else–especially while we were in FL for Christmas! I have a chronological record of everything we did for the scrapbook! 🙂 For the WIN!!!! Thank you, sweet friend! You know how to make a girl feel loved!! 🙂 Using the planner to record vacation memories is brilliant! I try to make sure I jot down what we were doing especially if I was taking random photos. I took a series of photos of Andy & Aidan looking at a map and I’m sure by the time I get to scrapbooking them I will have completely forgotten why I took them! LOL! So the planner will most definitely help with that issue! haha! One thing every day. LOVE that. If I can follow that advice, it will save many memories. I’m learning so much from this hop! And then there’s your layout. Just. Plain. GORGEOUS!!! Stephanie! You are always so encouraging and such a sweet friend!!! Thank you so much for your wonderful compliments! As you know blogging is a time consuming thing and fortunately I love it, but it’s so nice to hear that you enjoy reading it and that you are inspired! This just totally made my day!